This is a reprint from April 7, 2007 and still very much a subject of concern. It was “Fog a mirror,” to qualify for a home loan. Now it’s “Have an address,” to get a credit card (the number of cards you want to apply for is optional). The housing market ran amok so why can’t the credit card market? The credit card fiasco will come to an end, just like real estate. From our previous model suggesting the collapse of Loan Companies, we figured that they would be working for nothing the minute defaults hit 8%. It only took 6% to take them out. Let’s project that model out for a credit card collapse. Interest charged 20% less interest paid to cash suppliers 7% equals’ 13% interest on the float for the credit card companies. So in theory, 13% of their credit card loans defaulting puts them in a zero earnings scenario. From there it’s a reverse burn. There is the question on the $9,200 credit card debt owed “per household.” Is that per “card” or per “client?” Does Visa tell Master Card? From a computer point of view; J. Doe, John Doe, and John D. Doe are three different people. How many of these households have the same address? My dad before he died at the age of 81 (in 2001) had 10 cards and owed over $45,000 which they (you know who) had to write off. How can the banks issue cards to people that old? In 1987 he lost everything in the stock market crash and walked away bankrupt. So he had to wait 10 years to get these cards. These had to of been issued when he was 77 years old. To top it off he was using the cards to buy Florida real estate (he wasn’t doing that bad with it either). What if the major credit card companies sorted their cards issued by address. I wonder how many cards would pop up with the same address? My Dad’s address would have been good for 20 (his girlfriend also had 10). An acquaintance of mine who is a building contractor would be good for 30. We are not even discussing fraud. Times were good to us and the party was great. The credit card companies are functional units right now holding 2 trillion of unsecured debt. Once the credit card investor (whoever it is) realizes that he can’t just pick up his toys and walk away, it’s over. The money’s been spent. It’s gone. Whose money was it? That’s a question without an answer for the present. This is going to be a fun year--- Charge it!! Getting 20 gallons of gasoline is painless with plastic. And if you are over 80, use or abuse the hell out of the card. It gives new meaning to the phrase "You can't take it with you," especially to the bank that issued your card. Forget about the Government Sponsored Entity's (GSE'S) going bankrupt. That isn’t the problem. Fannie and Freddie were buying loans from banks, packaging them and selling them to investors. The banks then re-loaned those same funds out to another home buyer. This provided the markets with lots of liquidity. What has happened now? There are no investment buyers for these loan packages. The market has dried up. The Government can’t force Freddie and Fannie to buy loans and try to sell these financial packages, their investor base is gone. There are no buyers at these interest rates. Freddie or Fannie might unload some inventory to raise cash to cover bad loans in their inventory, but not purchase new loans even if it was top shelf stuff. The net effect is that market liquidity for home loans is gone. The middleman (the GSA) can’t move the merchandise. Freddie and Fannie are no longer a conduit for housing finance. Now, the banks are limited in the amount of new loans that they can write (Freddie and Fannie are not buying their paper). So what do we have? Thousands of houses for sale with no financing available. What do the Banks have? A very big bag of HELOC’s and second trust deed loans and credit card debt. The HELOC’s and second trust deeds are toast and to make things worse the banks have a bad cash flow problem. At this point, we have the banks trying to raise capital to cover their bad loans. There is no sense in issuing any new loans until the market settles. Where does the homeowner stand? They can’t sell a house without some bank financing the buyer. The point not really fully realized, is that it was the high velocity of money traveling through the real estate market kept the game going at a super fast pace. The present inability of Freddie and Fanny to act as a conduit, has ended the housing boom. You can argue that Freddie and Fannie are a bail out problem, but they aren't going to drop dead in 6 months; our banks on the other hand are in melt down mode. The real estate market is going to go from bad to worse. The economy's problem is a lack of liquidity (money with velocity). What does all of this mean? Interest rates have to rise to entice investors back into the GSE paper market. But as interest rates rise, the average home buyer can afford less house. For Freddie and Fanny, business is going to get even slower. Their losses could increase. Anything they took on an 80/20 basis has to fall to 80% and they still break even. Most financial organizations figure a worse case scenario of a 20% loss so Fannie and Freddie could still survive quite a while. This meltdown has little to do with Fannie and Freddie. Our financial institutions that hold MBS's, CDS's, CDO's, second trust deeds, HELOCS and credit card debt are the ones in trouble. That stuff is pure crap. Who owns it? We know the GSE's DON'T own it. It has got to be the banks and mutual funds. Don't be surprised if we have 10 bank closings this Friday--Big 3 day bank holiday. Plus Warren Buffet is buying more Wells Fargo or American Express (he didn't say which). It makes you wonder if the Sage of Omaha got a little Kansas "Weed" mixed into his Nebraska sage. I wouldn't hesitate to short either one, go figure. Speculators are shorting the two biggest GSE’s in the market place, Fanny Mae and Freddie Mac. Their stock prices could go to hell, but both company’s holdings are pretty sound. More so than the average bank. We are talking several trillion dollars and maybe 100 billion of bad loans. This could work out OK over time. If you’re a stock holder, that ain’t quite the case. The real issue here is the ability of either company to continue writing future loans. The cash isn’t available at these interest rates to keep money on the table for new home loans. This makes the housing mess worse, but really does little to the value of the loans on the books at Fannie and Freddie. The max 80% loan that they could write in California during the boom was $417K (that's for a shack with no indoor plumbing). The financial predicament of Freddie and Fanny might not be quite as bad as everyone thinks. The real issues of concern should be the HELOC”S (home equity lines of credit), credit card debt and second trust deeds. The Super banks like Bank of America, Citigroup, Wells Fargo, UBS and a plethora of retirement/hedge funds seem to come to my mind for some reason. These financial institutions are holding this garbage. Fannie and Freddie don’t own any. Some of the big banks in the United States could be on the brink of receivership. Don’t get me wrong, the banking part of each institution is fully FDIC insured but that is only a small part of the bank. These are one stop-shopping-banks, that do anything and everything. For instance, money market accounts aren’t normally under the FDIC umbrella and neither are retirement funds. You’ll see a little blurb at the end of your statement saying the account is SIPC insured. Could that private insurance cover a major catastrophe, like several big mutual funds dropping dead? Probably not. There were laws on the books dating back to the great depression that restricted banks from being a one stop shop. 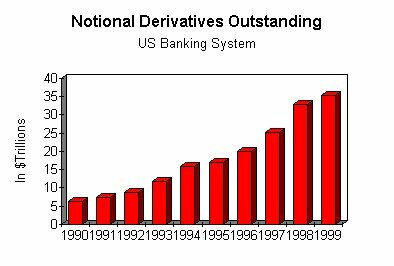 Congress decided to do away with those cumbersome restrictions so our banks could be more "competitive." We know where that went. Let’s see, we have the Fed loaning funds to Countrywide, Bear Stearns, Indy Mac and others too ill to be mentioned, amounts totaling 80 to 120 billion dollars. You can kiss the loan part good-by, it's gone. Congress sent out 150 billion to Joe tax payer. GM and Ford want a loan guarantee of 25 billion. Was Christmas early this year? Is the government a little off budget? The 2007 projection was under 2.5 trillion dollars. 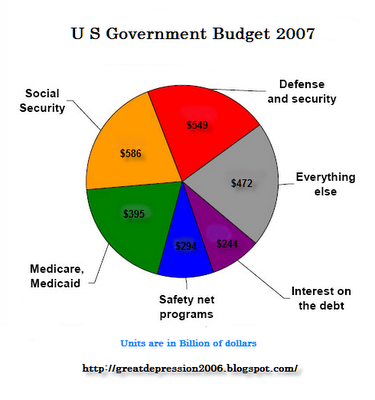 The government has spent 300 billion extra this year that is not on this pie chart. The only real difference between counterfeiting and inflation is who’s doing the printing. Even the banks admit to loosing over 400 billion. Our banking system is daisy chained to these ATM home loans. The government and the Fed are throwing money at everything. The really unbelievable thing is that none of these expenditures are even a part of the budget. When was the last time the government gave you a stimulus check for doing nothing? It kind of like coming home after a hard days work and your wife and son treat you unusually nice. You know they broke something, you're just not sure what! Where Did American Business Go? Once you realize that business does not pay taxes, you begin to see how Congressional thinking can be flawed, the cost is added to the price of the item. The employer doesn’t pay one dime into Social Security or health care, the worker does. The employee's wage is just a number that the employer adds to his cost of doing business. The entrepreneur in this country is motivated by profit. Employee productivity can increase profits. But notice if government wants a bigger share (taxes), there is an easier way to increase profits. Move off shore. Right now wages in China are from 25¢ to 60¢ per hour. A manufacturer making a product for sale in the United States can avoid a lot of tax by not producing it stateside. Ever wonder what sort of employee retirement plan China has to offer? The American consumer loves the cheap prices. The question comes up, “Do we really make anything in this country?” Notice that outsourcing gets rid of the high labor costs. Plus you are no longer a manufacturer; you are an importer/wholesaler. Life has suddenly become simpler; you can fire the book keepers. Think it out. Manufacturers set up shop in a foreign country. They pay less in taxes. Cutting American labor means their Social Security contributions are less. Of course, if you are unemployed because of this, you don’t pay any taxes either. That in turn entitles you to unemployment insurance for 36 weeks and food stamps (the ski slopes in Colorado will be packed this winter). 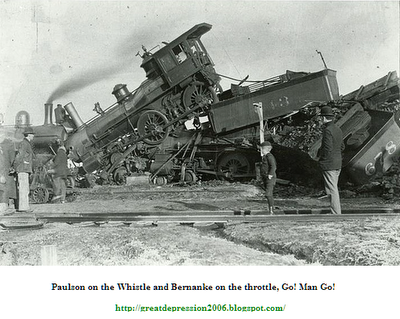 Do you get the feeling that this mess is building up momentum while traveling down hill??? All Congress did was raise corporate taxes, raise the minimum wage, and raise employer social security contribution amounts. By God, Congress is going to look out for Joe Six Pack. I know they meant well. Let’s face it; the only topic Congress can handle at an expert level has more to do with reproduction than anything dealing with basic economics. What is the net result of Congress’s actions? We don’t produce much of anything anymore. The industry we have left either sells hamburgers or Starbuck coffee. The tax base instead of increasing has gone down. So what will Congress do for an encore? I would hope nothing, but by god they’re hell bent to fix this up. It’s a little like sharpening the blade on your lawn mower while its running. You can trim your nails at the same time. Our markets have been pretty dull for the last two weeks except for oil and the precious metal's markets. There isn’t too much to write about without repeating myself but this web site Heritage.org has a good view of the present economy. There are about 20 visuals that are well worth a look. 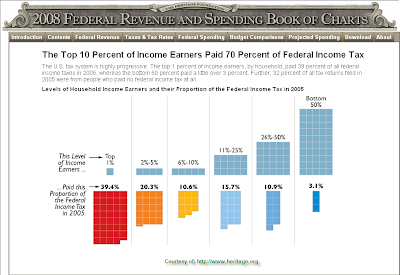 I particularly liked the one below that displays the amount of taxes paid by 10% of the population. Double click for a larger view. The scary part, is the fact that the government is very dependent on that “rich” group of people to fund the current budget. They could disappear in a financial implosion. The thing that has me in awe right now, is the amount of the projected financial losses by various institutions. Money is being lost, trillions of dollars. And still not one investor has lost a dime. Greed created this whole mess. People “invested” in a house to make money. The Realtors here in San Diego were probably trolling the border for new home buyers (they might have missed a few). Now I know why the phone systems around here say “press 1 for English and 2 for Spanish.” Then there were the finance companies that made 10K to 40K per loan. It was very obvious to bloggers back in 2006 that this real estate speculation lacked common sense. Right now, in our area in San Marcos, there are 6 houses in foreclosure and 5 in preforeclosure on Camino Del Sol (it’s probably a mile in length). We are talking 600K houses. It seems like in California we are adding 1,000 houses to the foreclosure roles daily and no one is really concerned. Do you get the feeling that everyone is holding their breath??? Nah, it's just my imagination running amok again. This is a reprint from June 25, 2006 that may be of interest to some of you. The market went up 331 today instead of down and Google is trading higher than $375. We only picked one market; there is the bond market, the commodities market, and foreign exchange markets, to name a few. At this point, the gunslinger is in a situation that looks like the kiddy game, where you have a hammer and hit the head that pops out of one of many different holes. The model turns into a real mess, when you realize that there are thousands of Mutual Fund Managers that will all be playing this game in real time. Naturally these different markets will be doing different things. The word "panic" comes to mind.